Space-saving solution: Under sink RO water filter are installed under your kitchen sink, they don’t take up useful space in your kitchen and they also stay out of sight. Easy installation: Under sink RO water filter Comes with clear and easy to follow installation guides for a quick and simple installation. 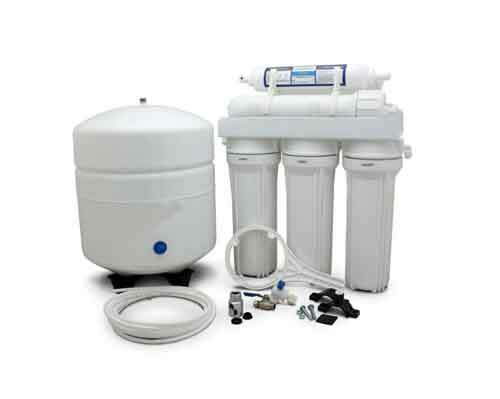 Cost-efficiency: Under sink RO water filters are one of the most affordable filters on the market both in terms of initial purchase costs and maintenance costs. Easy maintenance: In Under sink RO water filter Apart from the regular filter replacement, you don’t need to do anything else. Kills Bacteria’s: Under sink RO filter removes many bacteria and pathogens from tap water. Disease causing bacteria like Giardia and Cryptosporidium are effectively filtered out from your water source, thus eliminating the risks of you developing gastrointestinal or other types of illnesses associated with these types of pathogens and bacteria. Removes Chlorine: Under sink RO water filter will remove chlorine taste and odors ,your tap water will be safe to drink. Saves money : With an RO Water Filter you will save money on expensive bottled water.